A 25-year-old man went to the doctor in July after awakening with a pruritic rash on his chest, back, and abdomen. He reported feeling feverish with chills and malaise, but had no symptoms of respiratory distress and his vital signs were normal. He mentioned that he had gone snorkeling in the Caribbean the previous day, but did not remember being stung by any marine life. He said he was wearing swimming trunks and a t-shirt while in the ocean. The patient had a diffuse erythematous maculopapular rash on his neck, chest, back, abdomen, shoulders, and axillae. * WHAT IS THE MOST LIKELY DIAGNOSIS? Seabather's eruption is a pruritic dermatitis that occurs predominantly on areas covered by bathing suit or shirt after swimming in saltwater Cases have been reported in Florida, Bermuda the Caribbean, and as far north as Long Island New York. Larvae of members of the phylum Cnidaria are believed to be the cause of this dermatitis. Cnidaria include "hydrozoans (fire coral and Portuguese man-of-war), scyphozoans (true jellyfish), and anthozoans (sea anemones). The condition is sometimes called sea lice, although the organisms have no relationship to lice. All Cnidaria have microscopic envenomation capsules called nematocysts. Each capsule contains a folded, eversible tubule containing a variety of toxins. Skin contact or chemical stimulation of the triggering apparatus leads to a build-up of hydrostatic force, resulting in eversion of the tubule. Toxins pass across the tubule membrane and are deposited into the skin. 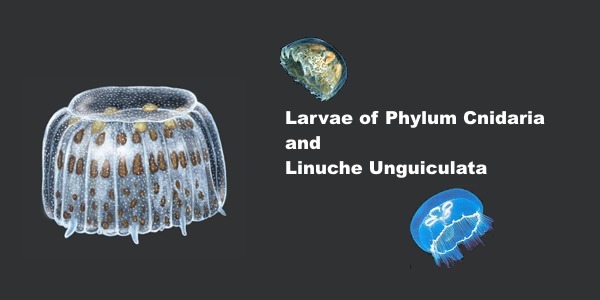 The cause of seabather's eruption in South Florida and the Caribbean has been identified as the larvae of Linuche unguiculata, or the thimble jellyfish. The adult Linuche measure 5 mm to 20 mm. They breed between March and September, and the larvae measure about 0.5 mm in diameter, making them invisible to the naked eye. These larvae are washed toward the shore by high tides or strong winds. They are small enough to pass through the weave of most swimwear, becoming trapped against the skin. Pressure applied to the skin or changes in osmotic pressure--by evaporation of seawater or showering in fresh water--cause the larvae to discharge their toxin into the skin. In a study of cases of seabather's eruption in the Mexican Caribbean, it was found that all 3 swimming stages of Linuche (ephyrae, medusae, and larvae) to cause the eruption. April through July are the months when the larvae are most prevalent, although they may appear at any time. The symptoms will appear very soon (24 hours or less) after exposure to the organism and will persist for several days. Some cases have been reported which have a three- or four-day delay in onset and a prolonged course lasting several weeks. Symptoms may include fever, chills, headaches, nausea and vomiting. Severe symptoms occur in children particularly, although adults have also shown similar reactions. Since many of these symptoms are consistent with many other illnesses, diagnosis is sometimes difficult unless the attending physician knows of the diver's exposure to contaminated water. Often the symptoms are very mild, and other causes may be considered or diagnosed incorrectly at first. Many of these cases of sea bather's eruption will clear spontaneously, but others may require treatment. Antihistamines and antipruritic (anti-itching) agents may be used, but the results are not good in many cases. Children and individuals with allergies or diseases affecting the immune system may be at risk for severe reactions. Fortunately, the severe reaction is rare, but it can be a danger for some individuals. In the severe case, some doctors prefer to use cortisone by tablet or injection. Prevention for the diver means adequate protection by wetsuit or impermeable dive skin. Snorkelers wearing T-shirts, and women wearing one-piece bathing suits are vulnerable because of the trapping action of the fabric. After diving or swimming in an area where the sealice larvae are present, remove your wetsuit, dive skin or bathing suit before showering since the fresh water may discharge the nematocysts trapped in the fabric. There have been reports of the condition recurring when the same bathing suit is worn again, suggesting that the larvae may remain in clothing. Seabather's eruption can be treated with sedating or nonsedating antihistamines (level of evidence. While sedating antihistamines may be more antipruritic and less expensive, they should be used with caution if sedation may pose a danger to the patient. Topical steroids, such as hydrocortisone, may be beneficial. Systemic steroids are reserved for only the most severe reactions. Comfort measures, such as oatmeal baths, may provide some relief of the itching. • The only real prevention is to not go into the ocean when there is a sea lice warning posted. Please check with the hotel front desk if they have reports on the property of sea lice presence in the beach. • Certain topical sunscreens may prevent sea lice attacks. Hydrocortisone cream and oral antihistamines, such as Benadryl, help to relieve the itching. There also are products sold at supermarkets and drugstores specifically for treating sea lice stings. • Wear smaller swimsuits. They offer fewer places for the sea lice to become trapped and sting in self-defense.